Three weeks after the 27 September regional elections, Catalonia is still waiting for a government, and relations with the Spanish government in Madrid have reached a new low. Meanwhile, Calatan authorities continue to plead the case for independence in Europe. On Thursday (15 October), the outgoing head of the Catalan government, Artur Mas, appeared before a Barcelona court on charges of breaking Spanish law when he organised a consultative vote on Catalan independence in November 2014. Mas had been summoned on 29 September, only two days after his separatist coalition swept to victory in regional elections. He is charged with civil disobedience, perversion of justice, embezzlement, and usurpation of power. 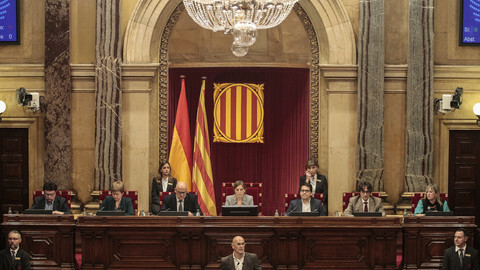 His court hearing took place on a symbolic day, commemorating the 75th anniversary of the execution of Catalan nationalist leader Lluis Companys by the Franco regime in 1940. 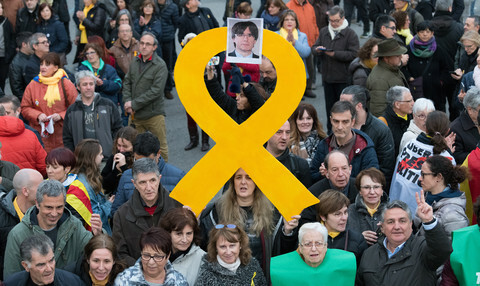 After the hearing, Mas said it was “unbelievable [that] institutions of the central State in Spain considered that to let the people have their say, to let them vote, is a crime”. Mas and Spanish prime minister Mariano Rajoy have not met since July 2014 and Rajoy is opposed to any talks on Catalonia's independence. 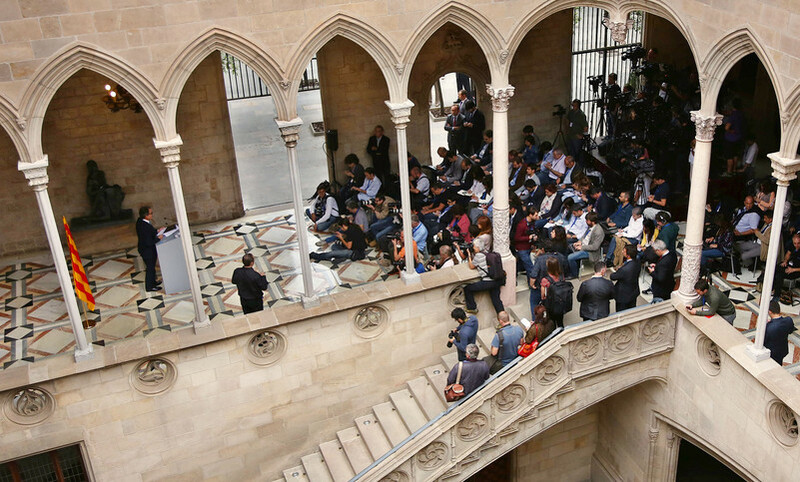 Mas' court hearing, as well as that of two other Catalan officials, came amid negotiations to form a regional government after the 27 September election. The Junts pel Si (Together for Yes) coalition, of which Mas is a leader, and the left-wing CUP party hope to finalise a common political programme and form a government by mid-November. Meanwhile, Catalonia's authorities are setting out their plans for independence and stepping up their European campaign to find allies. The objective is to organise and win a referendum on independence within 18 or 24 months and become an EU member. "We need a referendum," said Roger Albinyana, Catalonia's external affairs secretary, during a recent visit to Brussels. 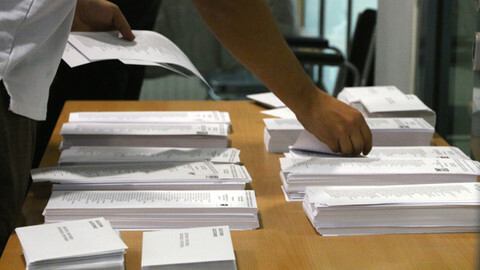 "A referendum is still the preferred way to address the issue. And we mean an agreed referendum with the Spanish institutions," he noted. 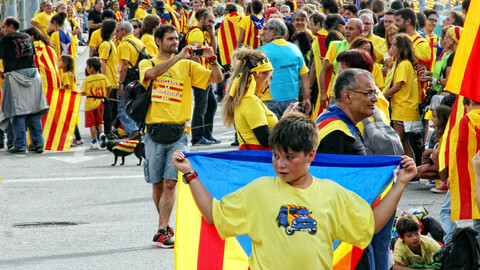 Although the ultimate goal is secession even against Madrid's will, separatist officials "want to talk," Albinyana said. "But we need to see someone on the other side of the table, otherwise it's a monologue, as it has been so far." In the power struggle with Madrid, Barcelona is looking to Brussels and other EU capitals. 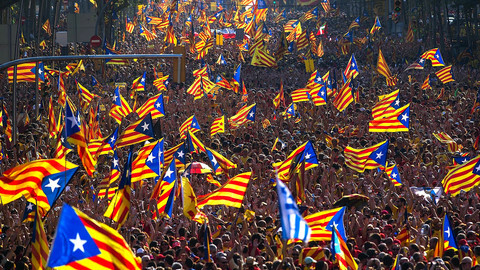 Separatists need to avoid a Spanish-only face-off that has brought no progress for them. Many Catalans also have a historical and sentimental relationship with Europe. “Catalan society has always been very Europeanist," Pol Morillas, a research fellow at the Barcelona Centre for International Affairs (CIDOB), told EUobserver. This is the case "not only at the political level but also at the social level," he explained. "During the dictatorship, Europe was seen as the hope where freedom for citizens could be defended." As soon as Spain joined the European Community in 1986, Catalonia opened a delegation in Brussels. 14 people now work at the delegation, next to the EU Commission and EU Council buildings. Since January, the region's permanent representative to the EU is Amadeu Altafaj, a former Commission spokesman, which guarantees good access to the institutions. "We use different strategies," external affairs secretary Albinyana said. "With the Commission, our relations are more based on sectoral needs and priorities rather than on the question of Catalonia," he explained. "The main commissioners are briefed. We brief cabinets, the president [Mas] meets commissioners and sometimes they ask about the situation in Catalonia." But so far, Albinyana noted, "the Commission doesn't have a say now because no member state requested it to take an official position". That is why, Albinyana said, Catalan authorities "mainly target member states". In case of a secession of Catalonia from Spain, it would be up to EU member states, not the Commission, to recognise the new state and to decide whether or not it is a EU member or has to apply. This would have to be a unanimous decision. "We meet them individually, in Madrid or in the capitals, in a discreet manner, because Spain is always after us," Albinyana said. Catalonia, however, is waging a war of influence with Madrid in the Commission. The objective is to have the EU executive enter the fray or even take a side. Amadeu Altafaj told EUobserver he has "informal contacts with officials in EU institutions and permanent representations". "There are frequent concerns about the immobilism and the lack of capacity for political dialogue" from the Spanish government, he said, adding: "Even people openly opposing independence are puzzled by the lack of politics". For Catalonia's permanent representative, even "a simple encouragement for dialogue [from the Commission] would already be progress." The Commission should pressure Madrid to talk with separatist authorities "in the name of general interest but also in the name of stability in southern Europe," Altafaj said, adding that "no one has interest in tensions or uncertainties in Spain, when there is a fragile recovery". The institutions "are looking more at the Catalan process now, especially after the referendum last year and last month's election,' Morrillas, from CIDOB, told this website . Catalan separatists expect a gesture from the Commission because "for some Catalans, neutrality in Brussels means that the EU is supporting the Spanish state," José Ignacio Torreblanca, the director of the European Council on Foreign Affairs in Madrid, told EUobserver. "But that is only because the European Union is a union of states. It is the states that are the partners of the Treaty and not people or nations." A few days before Catalonia's elections last month, the Commission seemed to take the side of Madrid. The episode revealed how the region and the state try to influence Brussels. In a written response to a question by a Spanish MEP from Rajoy's party, Santiago Fisas, Commission president Jean-Claude Juncker appeared to clearly support the Spanish position. "Determining the territory of a member state is only set by national constitutional law, and not by a decision of a regional Parliament contrary to the constitution of this State", the letter said in its Spanish version. But it appeared that this paragraph did not exist in the English version of the letter, which the Commission said was the only valid version. 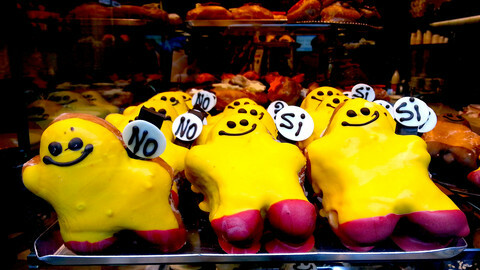 The style of the Spanish version was "very Spanish", Altafaj told this website. "Not only because it was written in Spanish but also because the language was a language the Commission never used on this issue in general." "Clearly a Spanish hand wrote this reply," he said. "The letter is a case of over-zealousness in the Commission, in contact with Spanish elements outside the Commission," he added, suggesting contacts between the Commission and Spanish authorities. Although in the end, Juncker "opted for a very short reply that referred to replies from previous Commission presidents" and said the difference "was due to a clerical error by the services of the Secretariat-General of the Commission, the Catalan official said "there was no mistake, there was manipulation." 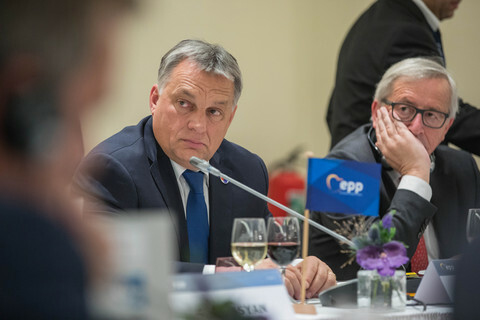 In a dispute that could destabilise the EU's fifth most populated state and fifth economy, the institutions, and the Commission in particular, have to strike a delicate balance. "The European Union does two jobs," ECFR's Torreblanca said. "On the one hand, it keeps neutral. On the other hand, it doesn’t support calls for sovereignty of any state, because other states are in similar situations and in the end it would lead to disintegration and not integration." The EU "will always be more comfortable with less states," the political scientist said. Even if the refugee crisis, the Greek crisis and the 'Brexit' issue pushed the Catalan issue "down on the list of crises in the EU, that doesn’t mean that the issue is not there," observed Pol Morillas. "Something that is still not an urgent problem could become an important political problem,” he warned.